This old article of Denny’s came up in my FB feed. What an important lesson! Click on the photo to access the article. It is oh-so-easy to get ahead of your horse when you are learning to jump. And then you are just one step away from jumping the fence without your horse. I suspect we’ve all been there, lying on the ground on one side of a fence while your horse stands on the other side and looks at you questioningly. It’s a surprisingly hard problem to fix because, as Denny points out, your natural tendency is to lean forward. This photo was taken at Pleasant Hollow but not at the event where I had that unscheduled dismount. 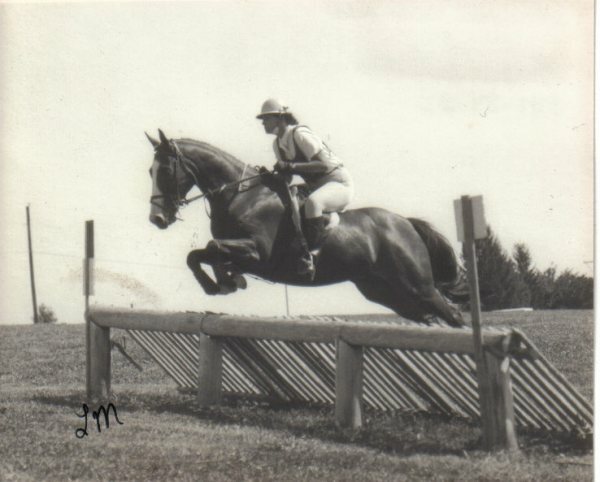 Many years ago when I was riding at an event at Pleasant Hollow (anyone out there remember that lovely venue?) I managed to jump the first fence of the course without my horse. Of course, my trainer got that fall on video and I had the pleasure of watching it over and over again, analyzing my fall in slow motion! Still, although I could see what went wrong, it was harder to fix it. My trainer had an ingenious solution: She had me ride another student’s horse. One that was a fabulous jumper except, he would not leave the ground if you got ahead of him. It made him a great teacher! Since then, I’ve also learned the “trick” of using a neck strap. Many of the trainers whom I’ve ridden with in the past few years are proponents and I wish I’d figured it out sooner. Looping a finger through the strap and remembering to lean back a bit keeps me more centered and stable. I’ve also learned that it’s sometimes better to get a wee bit behind (especially if you are holding onto that neck strap) than to get ahead. How did you learn not to jump ahead? I haven’t yet! Just kidding, sort of. It’s – as Denny said – terribly instinctive. I’ve been trying to fully break that habit for years. I got much better at it when riding a stopper, and now that I’ve switched from hunters to eventing it’s becoming much easier because I have to fully shed that closed hip angle hunter lean riding style. I’m figuring out how to sit up nice and tall all the way to the fence and (shocker!) it’s working wonders! I still occasionally jump ahead, but as I’ve gotten stronger in my lower leg, I’ve gotten better at staying with the motion. Yup. Jumping with no stirrups immediately isolates all the muscles that you didn’t know you had!